Karl Slym, managing director, General Motors India demonstrates the Chevy Beat electric. 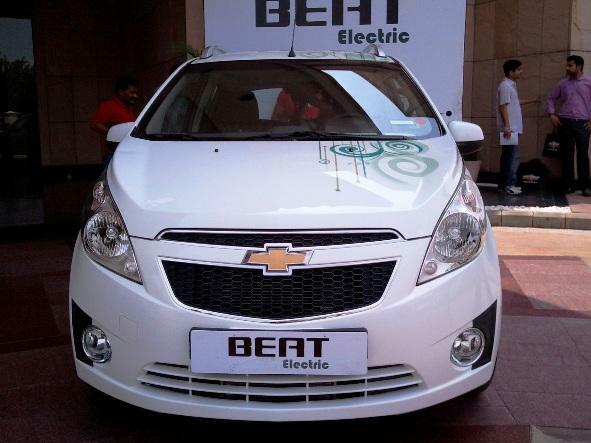 General Motors India today showcased the Beat Electric in New Delhi. The Beat electric will not see a commercial launch anytime soon, but we did get a drive in it, courtesy Karl Slym, managing director, General Motors India. The Beat electric is powered by a 300-cell lithium-ion battery (the same kind that powers mobile phones), with a capacity of 20kWh. The battery pack is liquid cooled in the Beat and weighs 270 Kg. It gives the car a range of about 130 km on a single charge under normal driving conditions. Charging the battery takes about 8 hours using a normal household 240 volt power outlet. The car is a front-wheel drive, powered by a 45Kw motor (that’s about 60.3 bhp of power). Being an electric motor, the car does not require gears and hence it just has a selector like an automatic. Torque is instantly delivered when the pedal is depressed and you can feel the car pull away really fast. In fact, Slym managed to spin the front wheels a couple of times when he stomped on the pedal. The instrument panel in the electric Beat is fully digital, with a digital speedometer, a battery-level indicator and a ball “driving” indicator. This shows if you are driving in the eco-zone or not, and whether the car is regenerating power. Some energy is restored to the battery when you brake, as the car is equipped with regenerative braking. In the U.S, General Motors launched a popular petrol-electric hybrid last year, the Chevrolet Volt, which is essentially a “range extender”. What this means is, the car is an electric car, with a range of about 160 km, after which a small 1.4 litre petrol engine starts up and charges the batteries, extending the range of the car. The petrol motor can also be called upon to provide additional traction. In India, the only electric car on the market right now is the diminutive Mahindra Reva, which has a range of only 80 km on a single charge. This reduces drastically in the air-conditioned model to just about 45 km. And besides the small size and odd-ball looks, the Reva’s replacement battery pack is frightfully expensive – Rs. 2 lakhs plus. And this battery pack may have to be replaced every three years. Tata too has developed an electric version of its Indica, which is on sale in the United Kingdom. The Indica electric, doesn’t make sense for India at the moment, because if it was launched here it would cost upwards of Rs. 15 lakhs! Electric vehicles aren’t economically viable at the moment, but as fossil fuel prices head north, we’ll have to bite the bullet some day. And GM is making sure it’s ready for just that day. Note: General Motors does not want the video of the Beat Electric drive publicly broadcast. Sorry folks!